A few days ago, OK it was a couple weeks ago, Dawnie @ The Coach's Wife's kitchen awarded me The Versatile Blogger Award. The award works like this, I pass it along to 10 bloggers who I think are amazing and tell 7 facts about myself. I feel like I have shared bits and pieces of myself along my blog journey but hopefully these will be newbies. My favorite part of cooking is sharing. If I am all by myself I would just have cereal. I tour colleges and universities for a living. If I have kids, they will be sure to get plenty of information on where to go to school. I cut coupons and feel so energized whenever I score a good deal. I love chocolate cake but cake is one of the few things I hardly ever make. It has been almost 5 years since I last baked one. I absolutely cannot start any project in the kitchen unless it is clean of dirty dishes. I workout on daily basis purely so I do not have to worry too much about my food choices. I cannot handle hard alcohol. A few sips of Mr. J's drink is plenty for me. There are a few things that to me scream home, mom, and comfort. One of them is lasagna. I had to go to Maine unexpectedly last weekend and my one request was homemade meals. Between traveling for work and our trip to Florida I had very little time to run to the grocery store let alone make a decent meal. I wanted my mom to cook for me. She certainly came through with that request with this great lasagna our first night in town. She makes a few versions but this was a simple, basic, no frills type. It was delicious. 1. Cook lasagna noodles according to box. 2. In a medium bowl, mix ricotta, egg, Italian seasoning, garlic, and Parmesan cheese together. Set aside. 3. In a 9x12 baking dish, spoon a layer of tomato sauce on the bottom. Then layer 4 of the cooked noodles across the bottom of the pan, overlapping slightly. Add 1/3 of the ricotta mixture and spread evenly across the pasta. Top with sauce. 4. Continue layering the remaining ingredients till the dish is full. 5. Cover with foil and bake at 350 degrees for 45 minutes. Remove from oven and then remove foil. Top with mozzarella cheese. Turn oven to broil and brown the cheese. 6. Once browned, remove from oven and let sit for 10-15 minutes before serving. This can be made a day in advance and stored in the refrigerator. You can easily add any veggies to the layering process. Fresh spinach or roasted squash and broccoli are two of my favorites. Finish off with a bottle of Italian wine and call it a night. Thanks Mom! It was enjoyed by all. I kind of wish you could cook for me every night. there is one place I must insist that you visit. The place is the Lobster Shack. It is located just down the road from Two Lights State park in Cape Elizabeth, Maine. See one of the lighthouses in the background? The restaurant is much. You go up the stairs and order out the counter. Sometimes in the summer the line can be quite long. To the left of the counter is about 6 tables for indoor seating. Most people eat outside. However there is one danger that looms. The. Seagulls. They can be quite dreadful and steal your food. Be careful. And don't be one of those silly tourist that feed them. You will get dirty looks. The view is worth the possible seagull attack. Can you possibly think of a better way to dine? The food is absolutely amazing too. This was what I ate... I always get the lobster roll. You get huge chunks of lobster on a toasted split bun. But the best part is you can get it with no mayo. That's right just pure lobster in this roll. I got the boat which comes with french fries. There is just something so yummy about crinkle fries. And then there was the cole slaw, sweetened with a bit of pineapple juice. I cannot eat the stuff but I hear it is delicious. Of course if you want to work a bit more for your meal you can certainly get a whole lobster. Others enjoyed fried clams. I have had this multiple times. Its delicious! Mr. J opted for the lobster roll as well. He got the mayo and a pickle. If shellfish isn't your thing, haddock is also on the menu. Shrimp anyone? Do you see how small they are? Well, that is true Maine shrimp. They are itsty, bitsy but packed with flavor. Now, I ordered the strawberry shortcake. It is somewhat of a tradition for me to get that so well this weekend was no different. I split with Mr. J but the rest of the table shared a true Maine dessert. A little whoopie pie anyone? Its big, delicious and can feed 6 people if need be. But really don't you just want one all to yourself? I cannot believe it is already Friday. I am not sure where this week went. I am also shocked that today is the official day of fall. Although the last few days have been cool and fall-like, today I am waking up to some humid weather. Maybe summer will stick around for a few more weeks. I have mentioned before how I love free things. Well, thanks to many businesses out there you can get a plethora of free things during the month of your birthday if you know were to look, where to go and what to sign up for. My favorite by far is Red Robin. You can sign up for their birthday club through their website. 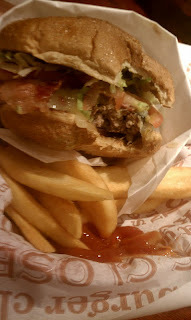 About 10 days before your birthday you will receive an email for a free burger of your choice. 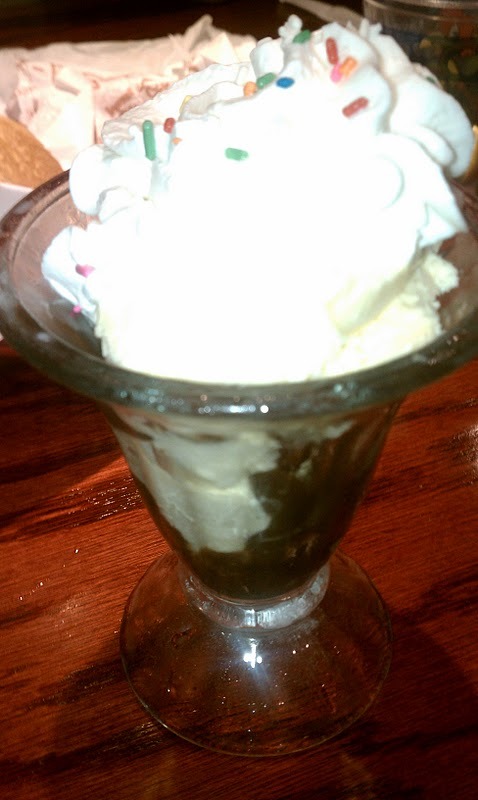 You will also receive a lovely sundae at the end of the meal. The total value of this is well over $10 dollars. Ruby Tuesday has a similar deal for a free burger. Cold Stone Creamery has a birthday club were you receive a free "Love It" Creation if you buy one. Dairy Queen's Blizzard Club will send you a Buy One, Get One Blizzard coupon. DSW sends out a free $10 off certificate. Starbucks and Dunkin' Donuts will mail you a coupon for a free drink of your choice if you are signed up with them. Chilli's and Boston Market will email you a free dessert treat coupon - Brownie or Cookie Sundae. Finally, If you are a member of Sephora you get a free birthday gift of a beauty sample - no purchase necessary. This year I got a 6oz Philosophy sample of shampoo and shower gel. There you have it, if you know where to look, and where to go you can score big the month of your birthday. There is one place that Mr. J loves more than any other place in Disney World. Of course that place would be a restaurant. A restaurant that happens to be an All-You-Can-Eat family style dining. This whole place is decked out in Polynesian style decor. After all it is in the Polynesian Resort. Also, known as the best place to get coffee in all of Disney world. This meal at times seems never-ending. I suppose if you just keep eating and eating it would never end. Right when you are seated they serve coconut bread. It is so good and honestly I could have one loaf and be happy for the night. Instead, quickly serve pork pot stickers and chicken wings. And if you are worried about getting your veggies, don't. You also get a helping or two or three of broccoli along side some of the best Asian noodles I have ever had. If that were not enough, here comes the part Mr. J loves the most...the meat. You get skewers and skewers of beef sirloin, chicken, pork, and shrimp. I think Mr. J had about 30 shrimp when we went. In the center of the whole restaurant was the fire grill where all of the meat appears. Lucky for us you are provided with hot towels to whip down before they bring out the dessert. The dessert by far is MY favorite part of the meal. That coconut bread they start you out with, well they never let that go to waste because they turn it into the most delicious bread pudding you have ever had. Topped with some vanilla ice cream and Bananas Foster caramel sauce. This is all-you-can-eat as well. I might have been able to talk my table of 5 into getting a second helping. I feel like I owe you an explanation for my absence, my lack of responses, and my utter negligence of the blog. It will come. Until then I leave you Oklahoma Joe's. It may be in a gas station. But it was one cool place. And there was a line...not out the door like usual. We were lucky it was a random rainy Wednesday; we only waited about 20 minutes. There was plenty of time to check out the menu and decide what we wanted. You go up and order at the counter, then step aside to pay. Finally. Volia! The food is ready. Even though Mr. J wasn't with me, I took his cues and got a combo platter. Ribs and 1 meat. I choose pulled pork because, well, they said it was a favorite. It came with one side and Texas toast. My coworker had a pulled pork sandwich and we shared the massive (small) portion of fries. Let me tell that I have sampled some BBQ in my life and nothing compares to Oklahoma Joe's. You don't have to take my word for it though, there are plenty of testimonials online. One of the most exciting parts about this trip to Disney was the day we planned on going to Universal. I haven't been ever and Mr. J hasn't gone for years. We probably would not have made the journey except for one thing...The Wizarding World of Harry Potter. I have read all of the books and seen all of the movies. I don't know when Mr. J got hooked but he was just as excited to see this last movie as I was. 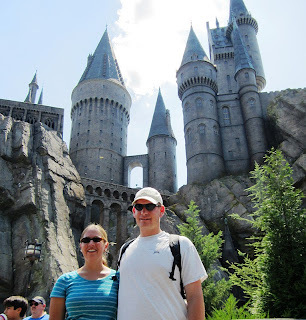 Thus, when we first heard about Universal's Harry Potter park we knew we had to pay it a visit. The park was built as the town of Hogsmeade. It was small but so cool and detailed. It by far surpassed all of the other sections of Universal. We go a demonstration of getting a wand. You know the one does pick you! I had to try the Butter Beer. It was so good. I go the frozen version and it was was like a butterscotch shake. I have a recipe and I am going to be making it all through October. Other than the three rides in this area there wasn't a whole lot to do. However, we had so much fun just looking at all of the details and decorations. It was one heck of a candy store! It was a great day, even though it wasn't Disney. Any fan of Harry Potter would love this park. This is my attempt at getting a close friend to start a blog. I met Laura 4 years ago and we quickly bonded over baking. She is a great writer and is learning to shoot with her new Canon Rebel. I cannot see a better way for her to share her baking adventures than to start a blog of her own. Today she shares with us how lucky she is to live in Hoboken, NJ. Show her some love in the comment section and maybe together we can get her to begin the blogging adventure. Lest we all forget, Hoboken was also the home of the legendary Frank Sinatra. Although I’m assuming that the majority of Americans would put soulful crooning above throwing butter and sugar into a mixer on the list of extraordinary talents, clearly the readers of this blog would not (and I’m not saying I would either) and so I’ll move on from my “there’s more to Hoboken than Carlo’s” rant, which really just stems from the crazy lines of people that wrap around the block and make it impossible for me to get to my gym. 1. 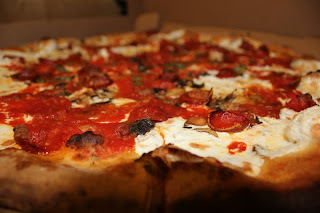 Grimaldi’s Pizza – This is, without a doubt, our go-to dinner option. Our first-time visitors are always treated to this not-so-little slice of heaven. The perfect proportion of crust to fresh mozzarella and toppings is a winner every time. Alex and I have been known to polish off a whole pie ourselves. Our standard order is a pepperoni and mushroom pie, “well done” so the crust is a bit crispy. Delish. And apparently we aren’t the only ones who think so since they just opened up a second location, all of 10 blocks from the original. 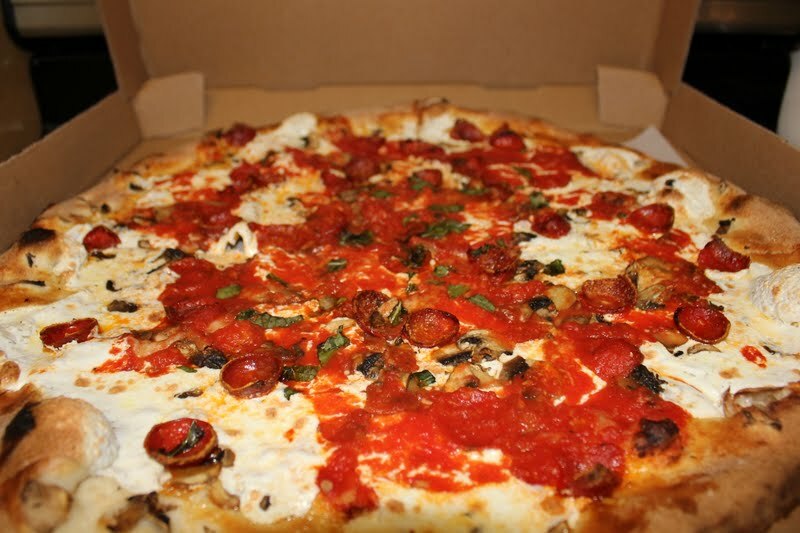 What can I say, we Hobokeners love our pizza! Now I need to go to the gym just from thinking about them. But it’s worth every bite! Usually I go healthy and order one of their salads (also amazing) and then proceed to steal ½ of Alex’s mac and cheese. You know, no calories if you share, right?